Brian Grazer, producer of such movies as Apollo 13, A Beautiful Mind, and Friday Night Lights, is on mission. He wants to promote curiosity. He is passionate about it. And from that passion comes a book, A Curious Mind: The Secret to a Bigger Life. Curiosity is what gives energy and insight to everything else I do. . . For me curiosity infuses everything with a sense of possibility. Curiosity has, quite literally, been the key to my success, and also the key to my happiness. Quite an endorsement, from someone who has been highly successful in a business that is both creative and difficult. 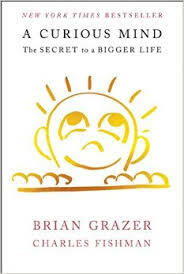 Underlying Grazer’s curiosity—and the focus of his book—is something he calls “curiosity conversations.” Grazer has spent his adult life seeking out interesting people and asking each one to have a conversation. Importantly, he doesn’t plan conversations with particular movies in mind, but just with the goal of learning something, with luck, something interesting. The well of ideas generated through curiosity conversations has sparked connections in dozens of ways that enhanced both his work and his life. The book A Curious Mind is interesting, even while it wanders a bit. But the notion of curiosity conversations is a fascinating one, and I keep thinking about how it might be used in school situations. Imagine giving students the challenge to have a conversation with an adult whose work (or life) they find interesting. Their task is to learn something meaningful to share with the group. How would it tie to the curriculum? Certainly planning and conducting a successful interview requires essential oral communication skills. And the results of the interviews could be shared in any number of written or multi-media forms. But perhaps most importantly, teaching students about curiosity conversations teaches them that curiosity itself has value. It is a reminder that some questions have many answers, and continuing to wonder can enrich their lives. Can you think of many lessons more important?